Yahoo! 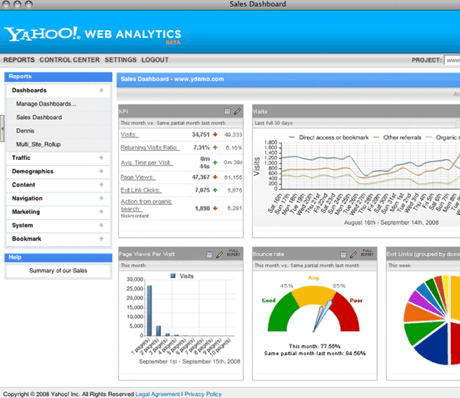 is going head-to-head with Google by releasing a free web analytics package. Yahoo! Web Analytics has just gone into private beta, so it will probably be early next year until it’s open for everyone to sign-up. However, the initial reaction of those who have used it seems positive. Yahoo! Web Analytics is certainly one to watch. I, for one, will be very interested to see how it stacks up against the excellent Google Analytics, which I recommend in my book. Ha! Well this is definitely interesting! I just spent last week looking around for and reviewing different analytics tools. Like you, I’d definitely be interesting it learning how this stacks up against Google Analytics (which I’m using amongst other tools). The other favs that I came across were visistat.com and Woopra (which is also in beta). The 1st however is a paid solution unlike Google, and Woopra.